We’ve just come off the phone to Asus, which had some rather good news for us. The brand spanking new Asus Eee PC 900 will be arriving at the Asus UK headquarters on Monday, and it will be bringing it into the TechRadar office by Wednesday. The second-generation Eee PC was announced some months ago, and made its debut at the CeBIT computing expo in Hannover, Germany back in March. One thing’s for sure, the Eee PC is becoming one of the most iconic computing products of the 21st Century. It's opened up a whole new product category that everybody else is now trying to copy. The new model is coming with a larger screen (8.9 inches at 1024 x 600), 1GB of RAM and 12GB of SSD storage, making it a big step up from the first model. It will also now be available with Windows XP as well as Linux. 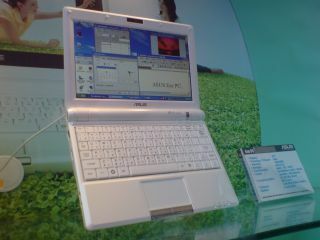 The new Eee PC is an extremely important product for Asus. And let’s not forget it's also pretty important for Microsoft, which is extending the life of XP just for ultra-mobile lappies. And for Intel too, which has developed the Atom platform to get into this new market with its aspirations of super power-efficiency and ‘everywhere’ connectivity. Intel all but announced it will be using a latter Eee PC to further its WiMAX aims. Atom will ensure it's pretty nippy, while the addition of an XP model simply furthers the possibilities. Our excitement isn't just for the Eee though, Asus' work will open up the competition in this market. We'll be talking about completely all-singing and all-dancing sub-£150 laptops by next year. Tune in next week for our in-depth review of the new Asus Eee PC 900.